Caught the travel bug but on a budget? Or planning an island-hopping honeymoon across a few countries? 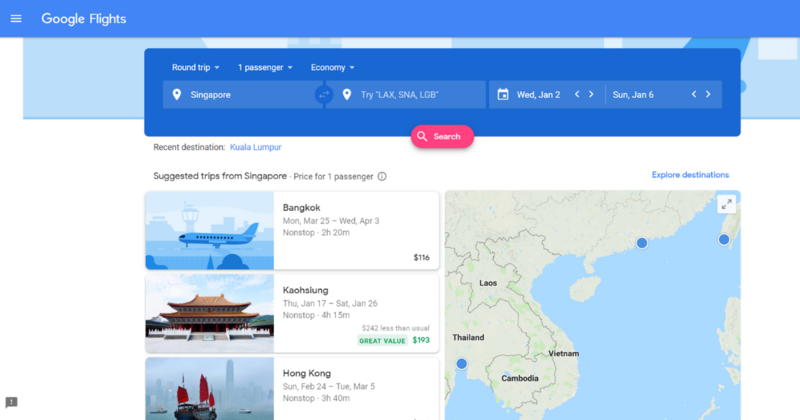 Singaporeans can now get flights to their travel destinations just by doing a Google search simply by typing the phrase “flights to”, followed by the name of the country or city, or by directly accessing the Google Flights site. Google Flights is a new feature that lets users easily compare flight prices and find travel inspirations all in one place and users can do that from their mobile device, tablet, or desktop. Singapore travellers looking to book their next holiday can find flights based on their preferred dates, pricepoint, airlines, connecting airports, or even explore flying to alternate airports, according to Google. For those looking for some #travelinspo (travel inspiration) for their next adventure, they can check out the ‘Explore’ tab for ideas on where to go based on a place or activities they want to do. Users can select a month and a trip duration and Google Flights will show the dates with the lowest price to visit a list of places. After choosing the departure and return dates, users will be shown a list of ‘Best departing flights’ that lets users see the best prices for different flight routes. Google Flights also offers users travel insights that can help them fly on dates with even cheaper flights, study price trends, compare prices near their destination, and travel tips. If users are not yet ready to pack their bags on the fly, Google Flights allow them to track a certain flight and receive email notifications to monitor price changes and travel tips. Have you previously used Google Flights, or are you already using it to book your next getaway? Share with us your experience!